** As a huge history buff myself, I can say that this is one of the best history education apps I’ve encountered for the iPad. - Tapscape.com, a leading reviews website. A very comprehensive app on the American Civil War made exclusively for the iPad. 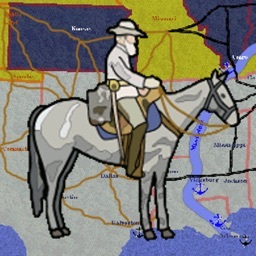 This app covers the deadliest conflict in American history in an innovative interface. Get a complete interactive experience with photos, audios, paintings, sketches, timelines, etc. 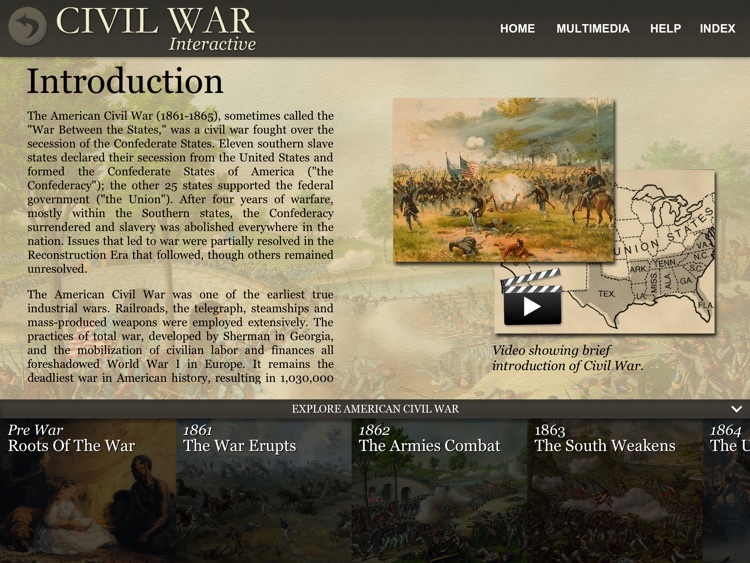 Read about the major battles and events of the Civil War in detail. 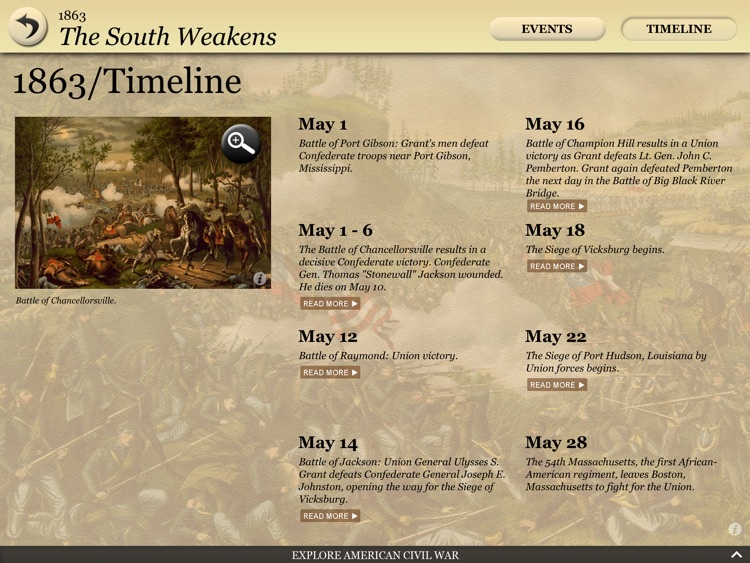 Swipe through the detailed timelines for every month of the war. Listen to recordings of famous speeches of Abraham Lincoln. See stunning photographs and paintings. 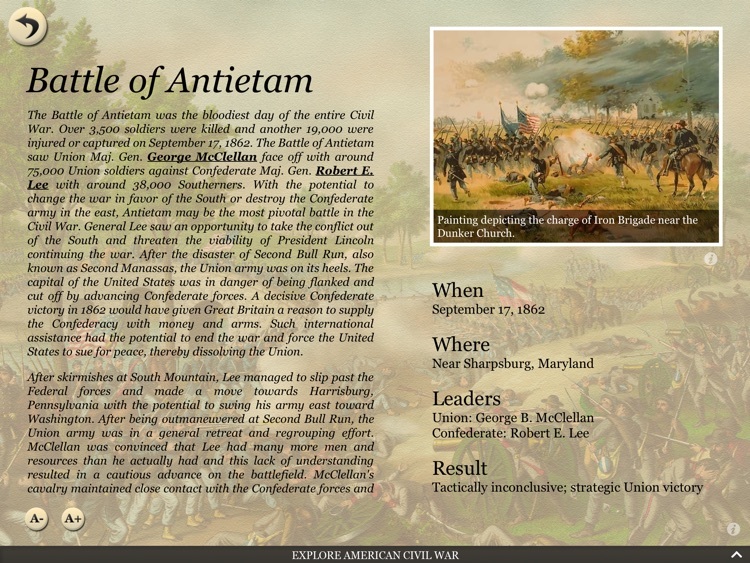 Learn about the people who led the Union and the Confederacy. 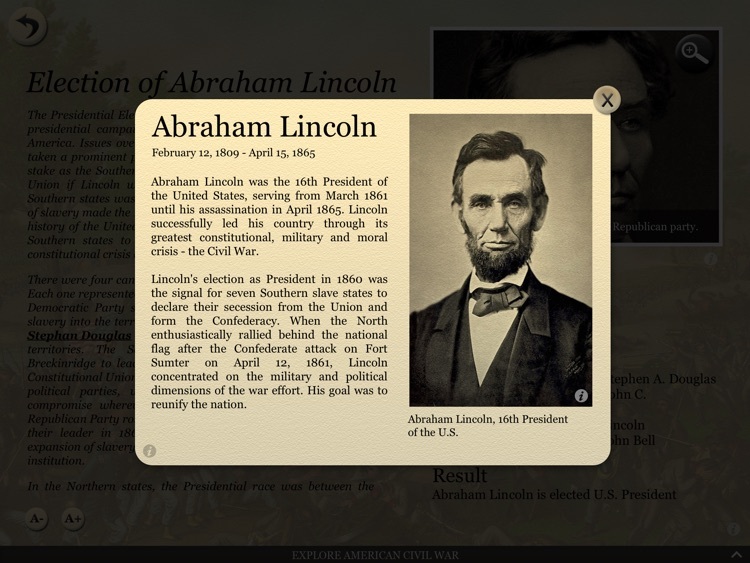 6 interactive timelines for the events leading to the war and in detail for every month of the war from 1861-1865. 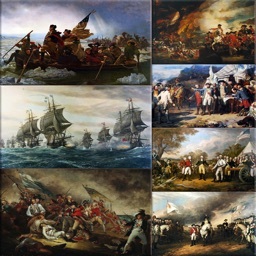 Over 750 amazing photographs, paintings and sketches with an exclusive Photo Features section featuring memorials, navy, battles, people, Confederate states, etc. 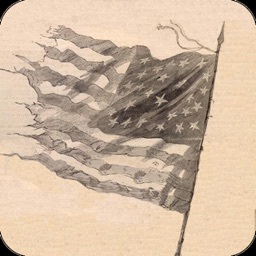 8 audio clips including a Civil War summary, 3 battle songs and 4 recordings of Abraham Lincoln's speeches, letter, etc. - Much better than reading a normal book. - Ideal for students, adults and history enthusiasts alike. 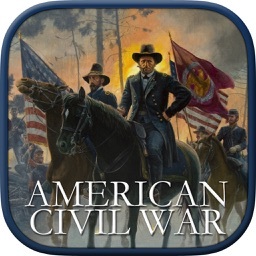 - Gives you a complete overview of the American Civil War without overloading you with unnecessary info. - Extremely easy to navigate, use, read and understand. - Has a complete index making it easy to jump to any section at any time. - Wonderfully designed with visuals and sounds. 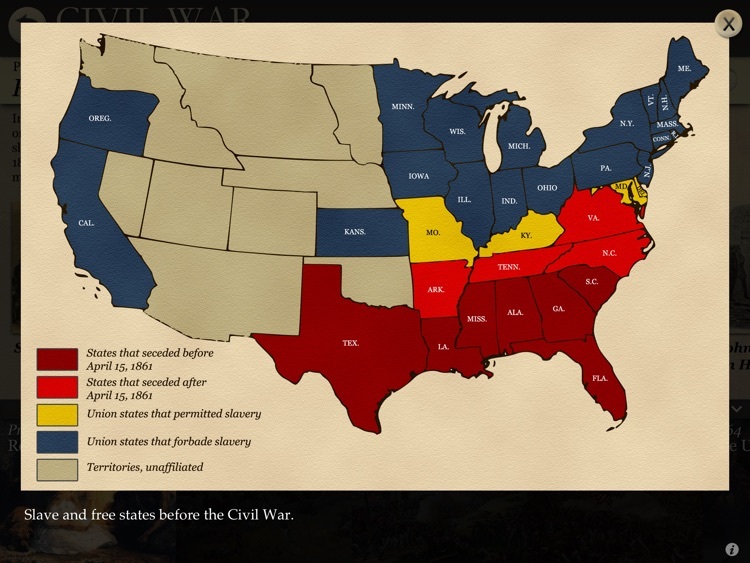 The app is divided into 7 periods: Events leading to the war, the 5 years of the war (1861-1865) and the Reconstruction era. All the major battles and events (from every theater of the war) are summarized in detail. 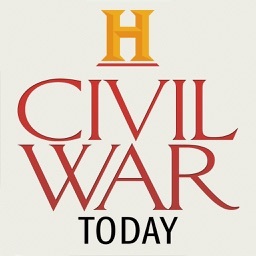 Topics covered include Rise of Republicanism, Slavery, Lincoln's election, Fort Sumter, Hampton Roads, Shiloh, Antietam, Emancipation Proclamation, Gettysburg, Vicksburg, Wilderness, Cold Harbor, Mobile Bay, March to the Sea, Petersburg, etc. and many more. All the important leaders, generals, small events/battles, etc. have been covered. Experience America's defining five years and witness the United States being reborn.